Live web chat - How can cities prepare for and manage floods? Floods are the most frequent among all natural disasters. In 2010 alone, 178 million people globally were affected by floods. More than 90 % of the global population exposed to floods lives in Asia. In Indonesia, a national disaster management agency was set up in 2008 to serve as a guardian of disaster risk management. 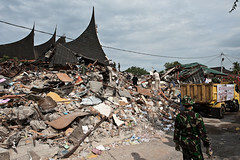 The agency's important role was clear in the aftermath of a West Sumatra earthquake in 2009. A collapsed building in Port-au-Prince. Photo by IFRC/Eric Quintero under a Creative Commons license.